Last week the court ruled to arrest Archimandrite Ephrem, abbot of the Vatopedi Monastery on Mt. Athos, in connection with a large-scale investigation into real estate deals between the Monastery and the Greek State initiated in 2008. On weekend the police came to the Vatopedi Monastery to arrest Fr. Ephrem. After medical doctors had examined the abbot, it was decided to leave him in the Monastery for health reasons. It was reported on Tuesday, however, that Fr Ephrem was arrested and taken away from Mr. Athos. 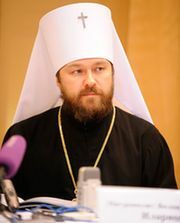 Metropolitan Hilarion, chairman of the Moscow Patriarchate's Department for External Church Relations, gave his appraisal of the actions of the Greek authorities in his short interview to Interfax-Religion. - Your Eminence, the Greek authorities arrested Archimandrite Ephrem, abbot of the Vatopedi Monastery on Mount Athos, who has recently accompanied the Belt of the Mother of God in Russia. Please, give your comments. - We do not and can not know all about the charges in abuses in real estate transactions made by the Vatopedi Monastery in the past filed against Fr Ephrem and other persons. Whether these charges are just, the Greek court will decide; we cannot interfere. However, it is quite obvious that detention under remand of Archimandrite Ephrem, who does not pose any danger, without considering the case on its merits and before a court ruling, is an extraordinary action that surprises us deeply. The authorities arrested nobody but the elderly and ailing priest. This ruling arouses grave concern of believers of the Russian Orthodox Church, puts her hierarchs on guard, and makes us ponder over its true reasons. - We know that the Vatopedi Monastery, once dilapidated, has revived since hegumen Ephrem has come into it. Fr Ephrem has done great services to the Vatopedi Monastery; this was shown by solidarity expressed by the Holy Community under the circumstances. Archimandrite Ephrem is widely known not only in Greece, but also in the entire Orthodox world as a spiritual leader, who zealously cared for the ordering of monastic life in accordance with the centuries-old traditions. Anyone who visited the Vatopedi Monastery experienced the spirit of hospitality that prevails in the monastery and embraces all the pilgrims. Fr Ephrem has become near and dear to many in the Russian Orthodox Church after the month he spent in Russia with a great shrine - the Belt of the Most Holy Mother of God venerated by millions of Russian believers. They are surprised how it happened that after returning from his trip to Russia the abbot of the largest and, one may say, exemplary monastery on Mt. Athos, was arrested in Greece, an Orthodox country, as it celebrates the Nativity of Christ. Their surprise is understandable as are the sentiments of many Greek bishops, clergymen, and laymen who believe that the ruling on Archimandrite Ephrem is a hostile attack against the Athonite monks and the entire Orthodox Church.